Admissions Essay: Indicate a person who has had a significant influence on you, and describe that influence. Michael Roth tells a very personal story about his deceased brother’s influence, and how he strives for goodness as a way of honoring the brother he never knew. His studies and research on tragedy and loss stem from his family’s own experience with death. Read his inspiring essay from the Wall Street Journal. 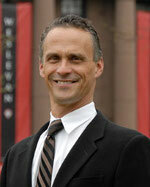 Michael Roth is the current president of Wesleyan University and former president of California College of the Arts. He is the author of five books, including Memory, Trauma, and History: Essays on Living with the Past, which was published Fall 2011.